Defining corruption can be a challenge. It takes many forms, and perpetrators are skilled in developing new ways to be corrupt and cover their tracks. Corruption occurs in both the public and private sectors. This includes media and civil society actors. Actors can be individuals, companies, or organisations such as a political parties. Corruption involves abusing power held in a state institution or a private organisation. Both sides involved in the corrupt act benefit, either in terms of money or undue advantage. Sometimes the ‘advantage’ gained may not be ‘undue’ or clear-cut, but is nonetheless an advantage. For example, in some corrupt societies people can only secure access to public health or education if they pay bribes. In such situations, those who can afford to pay have an advantage over those who cannot. The bribe-giver's ‘benefit’ is merely that which is anyway his or her rightful due. Bribe-takers receive an advantage for carrying out functions that are anyway their duty to perform. Grand corruption typically takes place at the public sphere's top tiers, and within the highest levels in private business. It includes actors that make rules, policies and executive decisions. It often involves large sums of money. Grand corruption is also often called political corruption, highlighting the negative influence of money in political processes, campaigns and political parties. Small-scale, administrative or petty corruption is the everyday corruption at the interface between public institutions and citizens. We find petty corruption as bribery linked to the implementation of existing laws, rules and regulations – for example when civil servants issue documents only if they receive a payment that is higher than the advertised official price for this service. Petty corruption also refers to the abuse of power in daily situations. For example, traffic police take payments from taxi drivers in return for not going after them for the breach of traffic rules. Usually, modest sums of money change hands in each case. However, when petty corruption is endemic, it can result in great costs. It can place stress on the functioning of state systems – similar to the effect of grand corruption. Often, it is not clear where petty corruption ends and grand corruption begins. For example, political corruption, in addition to the features above, can also encompass vote buying and other forms of petty corruption. And junior officials who demand illegal payments from citizens may do so because their managers demand a cut of their salaries in return for having been hired. These managers may have superiors who, in turn, expect money from them. This corrupt chain may stretch all the way up to senior state officials. Officials in public institutions force citizens to pay for services that should be free. Corrupt politicians pillage state budgets. Decision makers distort public spending as they focus on activities that yield large bribes, such as major public works. International companies avoid highly corrupt environments – economic development is slower than it would be with more foreign investment. When people cannot get access to healthcare, safe places to live and clean water, their lives are at risk. When buildings collapse because developers have bribed their way out of adhering to health and safety standards, the lives of occupants are at risk, too. Corruption has more than just financial costs. It reduces public trust and citizens’ willingness to participate in society. For example, citizens who perceive politicians as corrupt may not bother to vote in elections, get engaged in politics, or pay taxes. Human rights are violated as a result of corruption. For example, courts violate the fundamental right of access to justice when they only hear cases if parties bribe staff and judges . Corruption perpetuates inequality. Data shows that poor people suffer disproportionately from corruption. In modest income households, petty bribes to a nurse can cut deep into a family’s disposable income. Women sometimes bear worse consequences of corruption than men. For example, since women attend to family health issues more frequently, they receive more bribe requests from medical staff. In public life, female politicians may have less access to corrupt networks that generate votes and other support. Corruption is often linked to organised crime. It thrives in conflict and war. High levels of corruption can make prolonged conflict more likely, and push post-conflict societies back into war. Corruption also undermines the responsible management of natural resources. Corruption can undermine climate change initiatives, as powerful actors bribe their way out of environmental responsibilities in pursuit of profits. In many countries, criminal and administrative laws prohibit various types of corrupt acts. The UN Convention against Corruption (UNCAC) defines corrupt criminal behaviour that signatory states should include in their legal systems. Actions may be corrupt even if there is no law against them. The nature of corruption is often slippery and complex. It can evolve into new forms that criminal or administrative law does not capture. Therefore, anti-corruption practitioners emphasise prevention in addition to punishment. We call it bribery when a person with entrusted authority accepts or asks for an undue advantage (money, but also other material or immaterial valuables) to exercise a function, or to exercise it in a particular way. A kickback usually refers to a payment given in return for receiving a contract (for example, a building company that receives a government contract to build a road or other infrastructure). This payment goes to someone involved in awarding the contract. Bribery of foreign officials by private sector actors is also a crime in many countries. This means that bribes that take place outside a company’s country of origin may be punishable by the home country’s authorities. The OECD Convention on Combating Bribery of Foreign Public Officials in International Business Transactions is an important international legal instrument that criminalises foreign bribery, with a focus on the party paying the bribe (the 'supply side'). The fact that not all countries prohibit such bribes illustrates the point above that not all corrupt acts are illegal. Trading in influence – or influence peddling – is a form of corruption where, for example, a person exerts improper influence over a public or private sector decision-making process in return for an undue advantage. It is mostly people in prominent positions, with political power or connections, who trade in influence. These people abuse their channels of influence to gain money or favours. UNCAC recommends criminalising this form of corruption, but not all countries do. Corruption can grow in a variety of political and economic environments. It particularly thrives where accountable governance structures and processes are weak. However, weak governance does not necessarily always lead to corrupt acts – most people will still act honestly. Certain imperatives and incentives encourage people to engage in corruption. These may include, for example, low and irregular salaries for officials with large dependent families. Such officials may feel compelled to become corrupt. Social norms can also create incentives to participate in corruption. Some norms encourage giving favourable treatment to particular people – for example family members, or those affiliated with one's political group. Actors holding extensive discretion over resource allocation in environments where there is weak supervision likely have ample opportunities for corrupt enrichment. Incentives and opportunity create possibility, but perpetrators need ways of actually engaging in corruption. These may include control over an administrative process – such as tendering – or having access to offshore accounts and money laundering methods. Corruption will thrive where there are inadequate and ineffective controls. A lack of policing, detection and prosecution encourages corruption. Weak internal controls such as financial management, auditing, and personnel systems are also facilitating conditions. When authorities control and censor the media and civil society, corrupt politicians and officials have less to fear. We know much about different elements of anti-corruption work. However, there is no formula that will always work. How to address corruption always depends on the context. Experience of anti-corruption programming since the 1990s shows a constant tension between holistic and targeted approaches. Corruption results from a system of factors that facilitate and drive it. These factors range from individual attitudes to international opportunity structures – which points towards favouring holistic approaches. However, not all reforms are feasible in every setting. This, in turn, argues in favour of focused approaches, and to seek out context-specific opportunities. Work from the ground up. Ask 'what’s feasible here?' – rather than jumping to a model that worked elsewhere. Models can help define your range of possibilities, but always check what system pieces need to function before the model can succeed. 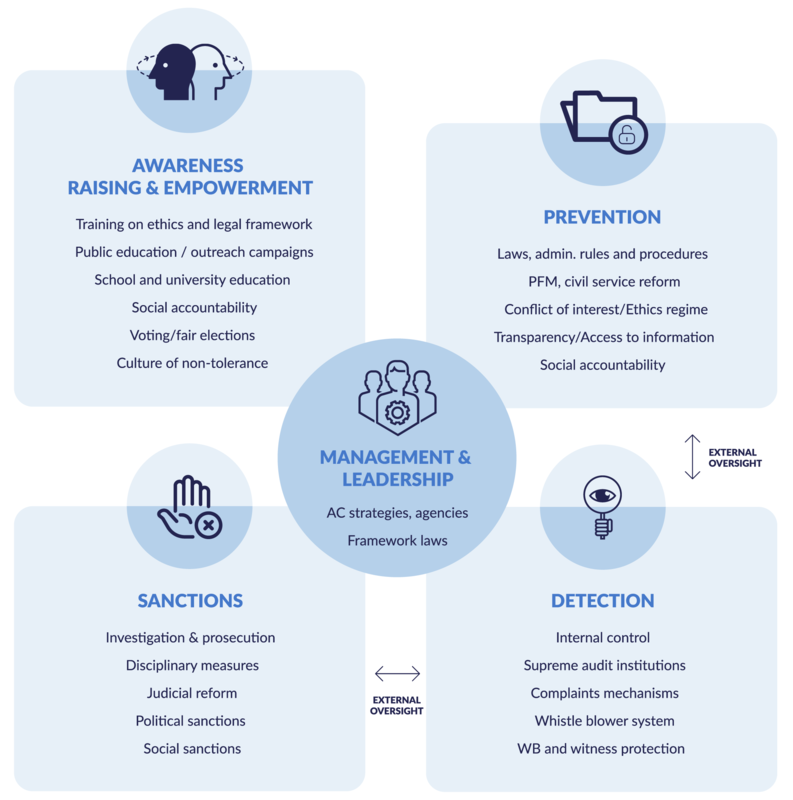 Decision-makers and practitioners must seek ways to reinforce anti-corruption programming approaches with inputs from other parts of the system. If civil society shall monitor budgets, the authorities must publish these in a useable way. Organisations like the World Bank, the United Nations, Transparency International and others have sought to capture what anti-corruption means. Their explanatory frameworks differ slightly, but we see a broadly agreed ‘menu’ of anti-corruption efforts. Anti-corruption efforts should not just be aimed at strengthening specific institutions or functions that are weak. They should build and strengthen mutually-reinforcing systems that include a range of interdependent actors, institutions, laws and policies. Donor aid delivery modalities are vulnerable to corruption. Aid flows may contribute to increased corruption levels in recipient countries. Researchers have studied which aid modalities are less vulnerable to corruption. Findings show little evidence that aid delivered through budget support is more or less prone to corruption than project support. However, evidence shows that for countries with both high levels of aid and corruption, there are compelling arguments against budget support. Donor aid can fuel corruption in recipient countries. It provides new resources to plunder. However, aid effectiveness depends on the quality of policymaking and governance – both within donor aid agencies and recipient country governance structures. Without good governance, aid effectiveness declines because of increased leakage of funds from development projects or national budgets. This is often due to corruption. Corruption may happen at all stages of aid disbursement. Programme design, the bidding process, the implementation phase, and even audits are at risk. Corruption can cause inefficient and incompetent companies to win contracts at excessive cost. It can lead to inappropriate and failed aid projects. The danger of corruption in development assistance is clear: aid is diverted from its original aims by corrupt politicians and officials. The perpetrators rather spend the funds on projects that allow for personal enrichment. Because of this, the funds never reach the poorest and most vulnerable citizens. Philp, M., 'The definition of political corruption' in Heywood, P. (ed.) (London: Routledge, 2015): 17–29. Mungiu-Pippidi, A. (Cambridge, UK: Cambridge University Press, 2015). Khan, M. H. and K. S. Jomo (eds.). (Cambridge, UK: Cambridge University Press, 2000). Khan, M. (London: SOAS, 2010). Cruz, C. and Keefer, P. Comparative Political Studies 48, no. 14 (2015): 1942–1973. Grindle, M.S. (Cambridge, M.A. : Harvard University Press, 2012). Blundo, G. and de Sardan, J-P. O. (London: Zed Books, 2006). Matfess, T. and M. Mikaucic (eds.). (Washington: Center for Complex Operations, 2016).